WinZip Computing, a Corel Company, has introduced a free update to WinZip® 17, now adding Box to its list of supported cloud storage services. 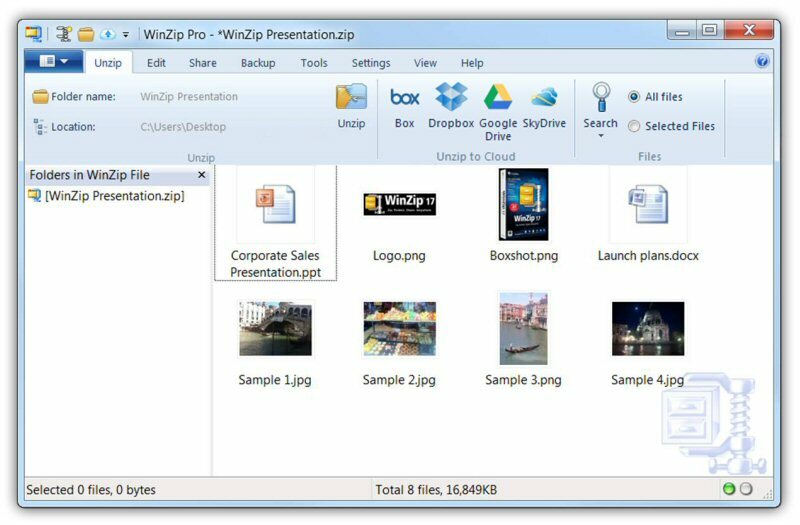 WinZip 17 delivers safer and easier file sharing with direct integration to popular platforms including Box, Dropbox, Google Drive and SkyDrive. Offering a better way to manage, protect and share in the cloud, WinZip 17 gives you a single place to access the files you've saved on your Box, Dropbox, Google Drive and SkyDrive accounts. Banking-level AES encryption helps you keep files safe from prying eyes. Zip compression lets you get the most from your free and paid-for storage space while saving time and bandwidth on upload and download. WinZip 17 also makes it easy to convert your files to the best possible formats for sharing and provides convenient ways to deliver files and links to your contacts through email and social media. "With new support for Box, WinZip 17 connects to the industry's leading cloud storage services, making it ideal for anyone who wants added security and convenience when saving and sending files. Whether you're using the cloud for better collaboration at work or to backup personal info and memories, WinZip is the trusted and affordable solution that lets you store and share with confidence," said Patrick Nichols, President of WinZip. The new WinZip 17 update with support for Box is now available as a free download to registered WinZip 17 customers. 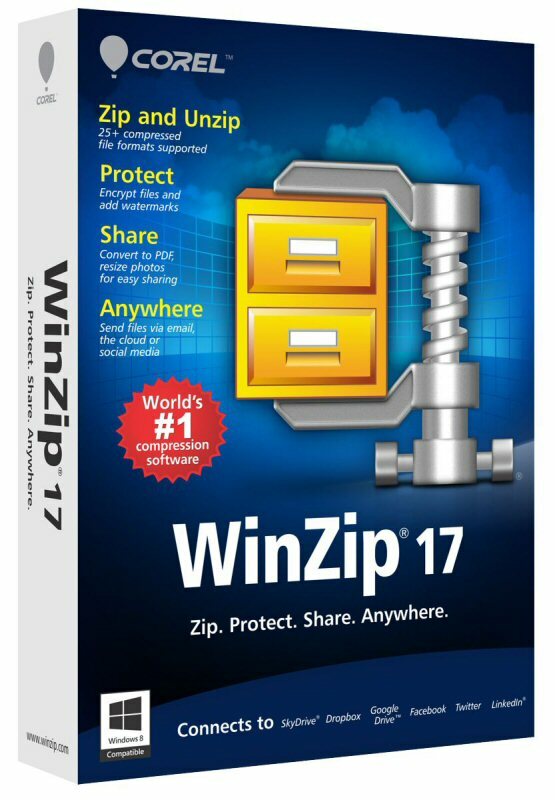 WinZip 17 is the latest addition to the WinZip product line which includes apps for all leading platforms including Windows 8, Mac, iOS, and Android, along with the ZipSend(TM) and ZipShare(TM) online services. Compatible with Windows 8, WinZip 17 also runs on Windows 7, Windows Vista and Windows XP. 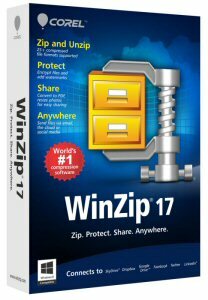 WinZip 17 is available now from www.winzip.com at the suggested retail price (SRP) of $29.95. WinZip 17 Pro is available for $49.95 SRP. Volume discount licenses are available. For more information on WinZip 17 or to download a free trial, please click here. For additional WinZip 17 resources including reviewer's materials and images, please visit www.winzip.com/newsroom/WinZip17. Connect with WinZip on Facebook at www.facebook.com/winzip. Follow our Twitter updates @WinZipComputing. Since its introduction in 1991, WinZip has been recognized as the leading provider of file compression technology. 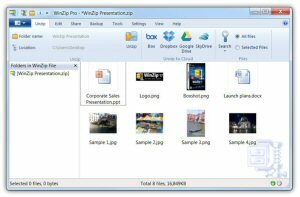 WinZip Computing, a Corel company, offers WinZip®, the world's most popular Zip utility, and other innovations including the ZipShare(TM) social media sharing service, the ZipSend(TM) file delivery service, WinZip apps for iOS, Android and Windows 8, and WinZip® Mac Edition. For more information about WinZip, please visit www.winzip.com. Copyright © 2013 WinZip Computing SL. All Rights Reserved. Corel, the Corel logo and the Corel balloon logo are trademarks or registered trademarks of Corel Corporation and/or its subsidiaries. WinZip, the WinZip logo, ZipSend and ZipShare are trademarks or registered trademarks of WinZip International LLC. All other product names and any registered and unregistered trademarks mentioned are used for identification purposes only and remain the exclusive property of their respective owners. To view the first image associated with this press release, please visit the following link: http://www.marketwire.com/library/20130127-WinZip17.jpg. To view the second image associated with this press release, please visit the following link: http://www.marketwire.com/library/20130125-WinZip17Screenshot.jpg.